Italian designers Marco Calabrese and Alessandro Scali have created the Giphoscope, a hand-cranked contraption that loops animated GIFs. 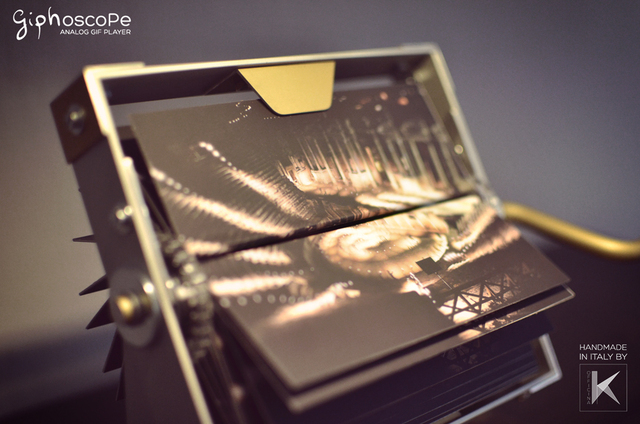 The invention, inspired by Herman Casler’s Mutoscope, creates the illusion of motion by flipping through frames of the GIF mounted on physical cards. Each Giphoscope is handmade and specifically designed to fit the aesthetics of the featured GIF. The analog GIF player is available to purchase online at the Giphoscope website.